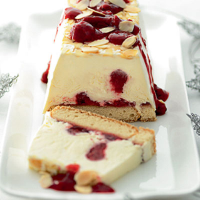 A fun twist on a festive favourite, with all the taste and ingredients of a traditional trifle frozen into an ice cream terrine and cut into slices to serve. Line a 450g small loaf tin (approx 9cm x 21cm and 6cm deep) with baking parchment or clingfilm. Scatter the almonds evenly over the base. Using an electric mixer, whisk the cream in a large bowl until thick. Fold in the custard and brandy. Spoon the custard mixture into the prepared tin. Drizzle the fruit compote over the top. Spread one side of the trifle sponges with the fruit spread and place, spread-side down, in a snug-fitting line in the tin, trimming them to fit if necessary. Press them down gently into the custard. Cover the tin carefully with clingfilm and place in the freezer for 4-5 hours or until firm. Remove from the freezer and leave to stand for 15 minutes before turning out. Sprinkle a few toasted almond flakes over the top and drizzle with the extra fruit compote before serving. To help turn the trifle out, dip the loaf tin in hot water, before carefully going around the edges with a sharp knife. Using brandy in this recipe will give the ice cream a much smoother consistency but you can leave it out, if you prefer. Freeze up to 1 month in advance.